This week's Vet Gazette Faculty Spotlight focuses on Dr. Stephanie Thomovsky, who has been promoted to clinical associate professor of veterinary neurology in Purdue Veterinary Medicine's Department of Veterinary Clinical Sciences. She was one of ten faculty members recognized at the annual PVM Promotions Reception in May. Dr. Thomovsky earned her DVM degree at Iowa State University in 2005 and then came to the Purdue University College of Veterinary Medicine where she completed her MS degree and residency in 2010. She also became a Diplomate of the American College of Veterinary Internal Medicine (Neurology) in 2011, and a Certified Canine Rehabilitation Practitioner in 2012. 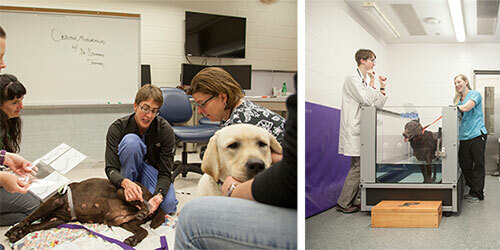 Her first faculty position was as a veterinary neurologist at the Washington State University College of Veterinary Medicine. She remained there four years and then returned to Purdue to accept an appointment as clinical assistant professor of veterinary neurology in October 2014. When asked about her favorite part of working at the College of Veterinary Medicine, Dr. Thomovsky said, "Teaching and instructing students is my favorite part of my job! I really enjoy teaching students the basics and making the subject of neurology more tangible and less intimidating." Her research interests include: vestibular disease, seizure management, and physical therapy for the post-op neurology patient. Aside from neurology, Dr. Thomovsky frequently enjoys competitive swimming. She is even a current member of the U.S. Masters Swimming community! When asked about her advice to those who wish to pursue a career in veterinary medicine, she said, "Make sure you like client communication and interacting with people, as veterinary medicine is more than just patient care – or should I say, remember when you are a veterinarian you have both animal and human patients!" Congratulations to Dr. Stephanie Thomovsky, the focus of this week's Faculty Spotlight, as one of ten promoted PVM faculty this year!